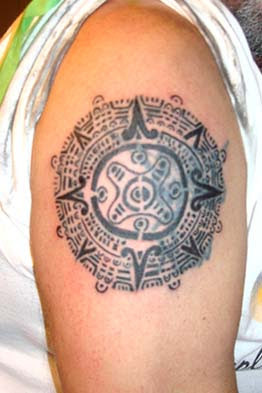 Aztec tattoo sign has shown devotion to the nature God for peace and prosperity. It also states the rebirth and afterlife. People ink the Aztec tattoo sign on basically chest, wrist, and stomach to give prayers to the Almighty, the Sun god, considered as the greatest power of all. It is a contemporary art form, besides its being as fashion symbol. 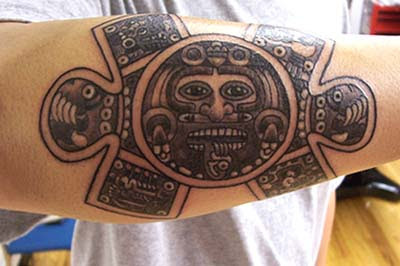 The present Aztec tattoo sign as a face inside the orb is a pictorial depiction of Sun. It is a humanized tattoo, geometrical in shape with simple and obviously,wonderful visual appeal. The bold lines hold the honest search of divinity behind the figure.